When a new business opens up, it always has to start small. And usually, there's not much margin for error, because being the rookie or the under-dog means handling challenges better than what's expected. For any business, start-up or otherwise, the online presence part is very important, and usually involves a lot of work, from setting up social profiles to producing great content and then promotions, aka Internet Marketing. Such start-ups usually don't know much about the process, and hence end up making mistakes that should not be made. 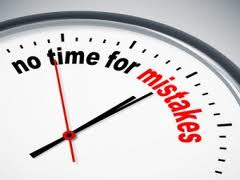 Some of these mistakes could hurt the initial phases of the business. Here are the 5 most inconvenient mistakes that should be avoided. Obviously, the most important first-step that needs to be taken. Small businesses often start up no sub-domain blogs. Not only is it unprofessional and not-recommended, it also could cause much serious problems. The internet is ravaged by people who'd do anything to earn some money. And usually, what they do is, when they spot a start-up that doesn't have its own domain, they buy that particular domain for themselves and the business then has to buy it from them at a much steeper rate. Imagine (just for argument's sake) www.microsoft.com being owned by someone other than Microsoft itself. In such a case, Microsoft will have to buy off that domain at a price dictated by the seller. The same goes for social media profiles (vanity URLs). For start-ups, it might also pay off to buy a professional theme or template (if using WordPress or Blogger etc) rather than using a free template. Free templates are un-professional, and run the risk of being hacked. It might pay off here to hire a web-developer to do the development. Most businesses usually don't have much money at start-up, or perhaps are unwilling to spend it. But there's one thing to always remember. Investment is the most important thing in a business, and can be the best thing that ever happened to it. For example, website owners should try to invest in things like premium plugins, premium mailsoftware, hiring contributors, editors, etc. It might look like too much too fast, but it'll all make sense once your audience or customers go up. Another very important step is making the website simple and effective. There should be an obvious call to action in the visible area, and visitors should easily be able to find their way around. User-friendliness is the one thing most people online are looking for. And this is what many businesses overlook. Analytics data gives you insights into how well a business is performing. But many business don't go beyond the casual number of page-views check daily. And most won't set up Google Analytics from day one. Well, monitoring user data is one of the most important step in marketing, without which no business can succeed. Business owners usually think they have it all figured out, and can do fine on their own. Well, getting professional help could never hurt. And in all likelihood, they are not experts in every field, and there are many aspects on Internet Marketing. So just to make sure you're on the safe side, you should get professional help (albeit paid) if you're running your own business.